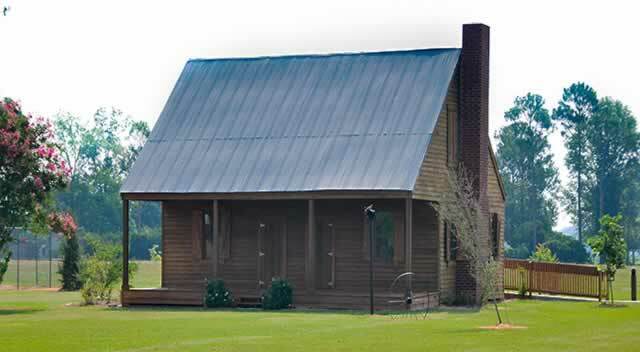 This museum is located at 77 Long Leaf Road in Long Leaf, Louisiana. It includes an historic 57-acre sawmill and company town, complete with picnic areas and a nature trail. Railroad motorcar rides are available. An admission fee is charged. The Museum offers audiovisual presentations, exhibits, souvenirs, and snacks in the commissary. It is normally open Tuesday-Sunday ... phone 318.748.8404 for current opening hours. The Edwin Epps House is a single-story, wood-frame Creole cottage presently located on the campus of Louisiana State University at Alexandria. Though the Epps House has been moved from its original location and has lost a significant portion of its original building materials, the physical presence of the structure retains its historic significance in association with the famous slave narrative Twelve Years a Slave. Admission is free. LSUA is located at 8100 Highway 71 South. Booker Fowler is Louisiana's largest fish hatchery. It is home to the Louisiana Lunker Bass Program and produces primarily Florida largemouth bass in addition to catfish, striped bass and paddlefish. The visitor center features handpainted murals, riverine exhibit, estuarine exhibit, bass exhibit and turtle exhibit. It is open from 6 am-4:30 pm Monday-Friday, and admission is free. The hatchery is located at 10 Joan Stokes Road in Forest Hill, Louisiana. Phone 318.748.6914 for more information, directions, or to confirm opening hours. Just south of Alexandria on Highway 1 is Marksville, the home of the highly successful Paragon Casino Resort operated by the Tunica-Biloxi tribe. Paragon Casino Resort includes a world-class casino with the most popular slots and table games, a large poker room and an off-track betting parlor. Lavish hotel accommodations with more than 500 rooms and suites are available onsite. Also found at the resort are an indoor tropical pool with swim-up bar, full-service spa, three-screen cinema, fabulous dining choices, retail shops, and a championship golf course. The resort also features live entertainment with top-class Las Vegas acts, Hollywood stars, concerts, and country music legends. A long-term attraction in Marksville is the Indian Mounds at the Marksville State Historic Site, located on 42-acres on a bluff overlooking the Old River, adjacent to the town of Marksville. Professional archaeologists consider this prehistoric Native American ceremonial center to be of unique national significance. The main portion of the Marksville site is surrounded by a semi-circular earthwork which is 3,300 feet long and ranges from 3 to 7 feet in height. The Marksville State Historic Site was designated a National Historic Landmark by the U.S. Department of the Interior in 1964. The site includes prehistoric Indian mounds and Indian Village sites dating from 1400 A.D. and a museum featuring artifacts and exhibits of the Indian culture. The Tunica-Biloxi Cultural and Educational Resources Center (CERC) is a $13 million project in the Tunica-Biloxi Tribe's comprehensive, long-range plans to aid in broadening the cultural, artistic, and educational offerings to not only its members, but to the surrounding communities as well. The 40,000 square foot facility will house a museum, gift shop, library, conservation and restoration laboratory, auditorium, classrooms, distance learning center, and meeting rooms. Many other area tourist attractions are nearby, such as the Hypolite Bordelon House, a Creole cottage which houses a museum and tourist center. It was built between 1800 and 1820, and the museum interprets the lives of early settlers of Avoyelles Parish. Other attractions include the Grand Cote National Wildlife Refuge, Lake Ophelia National Wildlife Refuge, and the Sarto Old Iron Bridge.